Swap your old lock for a Yale Keyfree Connected smart lock, and you can forget about keys. Just tap in your PIN code or nonchalantly wave your remote key fob to shoot the bolt. Or fit the optional Z-Wave module, download the app and open the door with your smartphone. If all else fails, it does actually come with a key. The Nest Learning Thermostat can replace any wired or wireless controller, giving you remote access to your boiler from your phone. It also learns your preferred heating habits and knows to switch off the heat when it senses everyone is out. Nest Protect screws to the ceiling and joins your home network in order to communicate with any other Nest devices you have in the house. It means that if carbon monoxide is detected, for instance, it can instruct its cousin, the thermostat, to switch off your boiler. How many electricians does it take to change a smart light bulb? Just the one, but he can fit as many as he likes and they'll all work from the same app. The LIFX Color 1000 bulb works with the Nest Protect alarm, so in the event of smoke, the light will start flashing red. 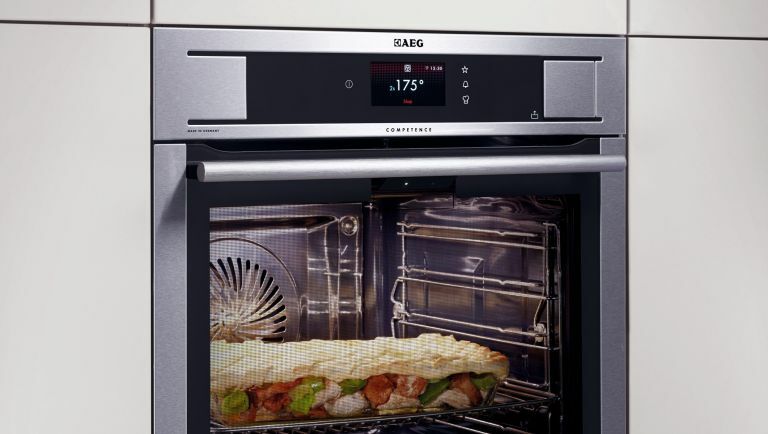 When you install the AEG ProCombi Plus smart oven, connect it to your home network as well as the gas and electric. That way, you'll be able to access the internal camera from your Android or iOS device and watch your meal cook, or adjust the settings from the comfort of the sofa. The Samsung F-Hub RB 38J7755B1 fridge has several cameras located inside it, so you can check that your cheese is behaving itself, or see what you need to buy while you're down the supermarket. The 21-inch display in the door is for browsing the internet or mirroring TV from your smartphone. Why would you want to connect the Samsung WW9000 to the Web? Firstly, because it means you can use the slick companion app to customise the cycle to suit your garments, but also so that you can start it off and check its progress while you're away. The Samsung KS9500 (like all of Samsung's 2016 SUHD sets) comes with a SmartThings hub attached, so your TV becomes the control centre for up to 200 SmartThings devices when it's switched on. Connect the SmartThings baby monitor, for instance, and a picture-in-picture will open up on the screen when noise is detected. If you install a SmartThings Power Outlet for your motorised blinds to plug into, they instantly become smart, which means you can now control them from a Samsung TV or an app on your phone. This could be useful if you want to give the impression you're home, when you're actually on holiday. Samsung's M7 speakers make it exceptionally easy to set up a wireless multi-room system throughout the house, thanks to the helpful companion app that gets all of your speakers online in just a few taps and swipes. Access your music from your smartphone or your TV, and it'll be available in every room. Position it beside your bed and the Withings Aura will rouse you gently in the morning with gradually increasing white light that mimics the sun rising. Alternatively, you can connect it to your home network and stream your most rocking Spotify Premium playlist at full blast. Use your smartphone to set a schedule, change colours and stream music. If you swap out your regular bulbs for Philips Hue E27 lights and download the app, you'll be able to set up lighting schedules from your smartphone and operate them from your Apple Watch. Hue also 'works with Nest', so you can sync it to react appropriately to warnings from the Nest Protect smoke alarm. Now even your shower can be controlled from your smartphone when you install the GROHE F-digital Deluxe spa. With LEDs, water jets, steam modules and waterproof speakers at your disposal, the Android/ iOS companion app makes it possible to design your ultimate therapeutic shower experience. It's a water park for one. Your body weight used to be between you and your scales, but with the Garmin Index the results are shared wirelessly with both your phone and fitness tracker. BMI, body fat and muscle mass are all presented for scrutiny in the nifty Garmin app. If you set up the scientific Netatmo Urban Weather Station, with the hub indoors and the sensor in the garden, you'll be able to track the increasingly fickle weather in precise and exhaustive detail on the companion app. Chances are your very local weather reports will be more accurate than the national forecast. The little Netgear Arlo camera needs little installation, as it's wire-free and runs on batteries. It's also waterproof and small enough to site somewhere inconspicuous. Just ensure it's within range of its base station, so you can access its HD video feed at any time from your phone.